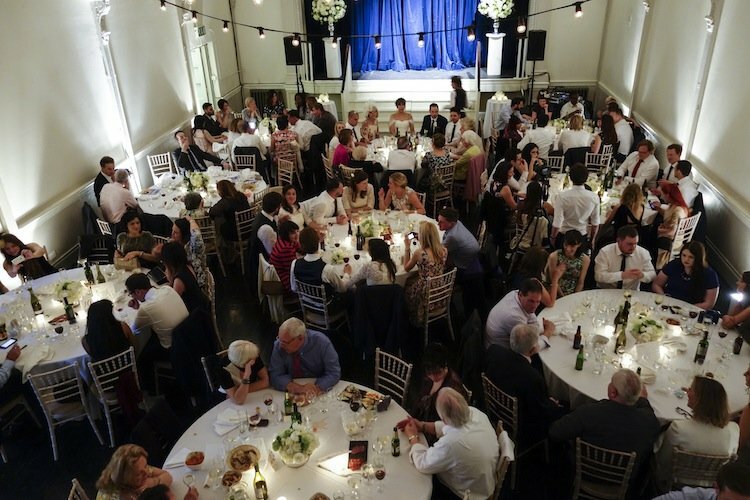 More and more grooms get involved in wedding reception planning. While we by no means doubt their organisational skills, it's always best to run through the checklist with the professionals. Our top-notch supervisors are here to help! Are more grooms taking on the wedding planning? Definitely, yes! It’s not so unusual for a groom to take responsibility for the Big Day preparation and leave his bride to concentrate on the fun ‘girly’ part – choosing the dress… One recent bright example – our client Andy. 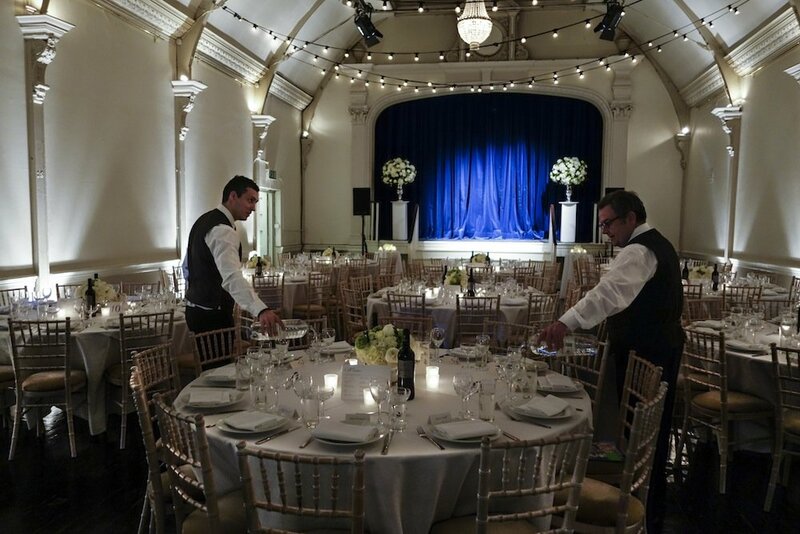 To put our clients’ minds at ease and reassure them that every detail will be taken care of by our dedicated team, we always recommend meeting one of our supervisors at the venue before the event and run through the timeline with them. It’s always nice to get the feel for the venue and for a very small fee of £25 + vat clients have an opportunity to get to know their supervisor in person and ask him/her any questions they may have. Andy chose to have this option and met our supervisor Iryna at the venue, 20th Century Theatre one month before the Big Day. 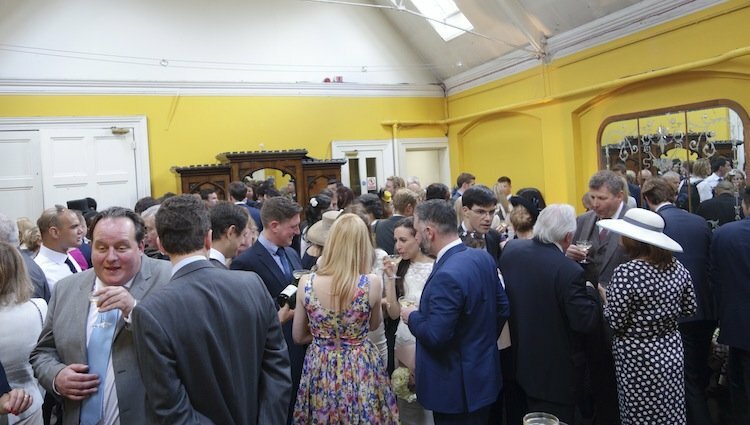 They ran through the wedding reception plan and flagged up some small things that Andy had missed, such as ordering trays and a second round of champagne glasses for the toast. They also discussed the floor plan of the theatre hall and ‘yellow’ reception room, had a look at available furniture and agreed on staff tasks and timings. As Andy mentioned later, this meeting was very efficient and reassuring. 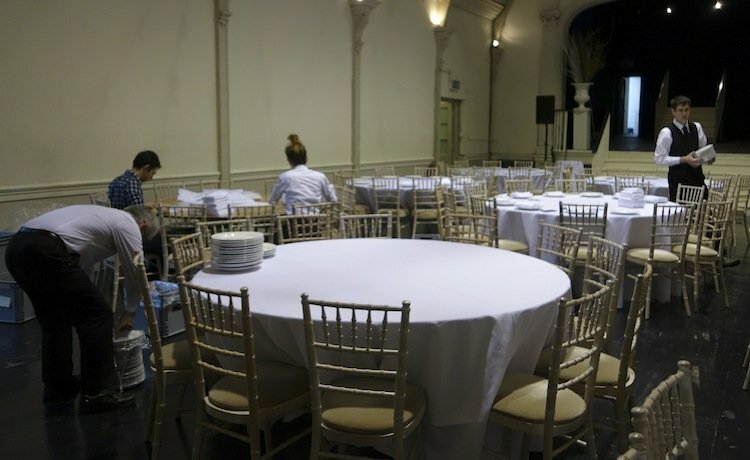 6 x Salt&Pepper staff arrive to set up tables and chairs in the Theatre Hall and bar area. Salt&Pepper staff to help plate up the food with chef. 2 x extra Salt&Pepper staff to arrive to help set up for drinks reception and serve. 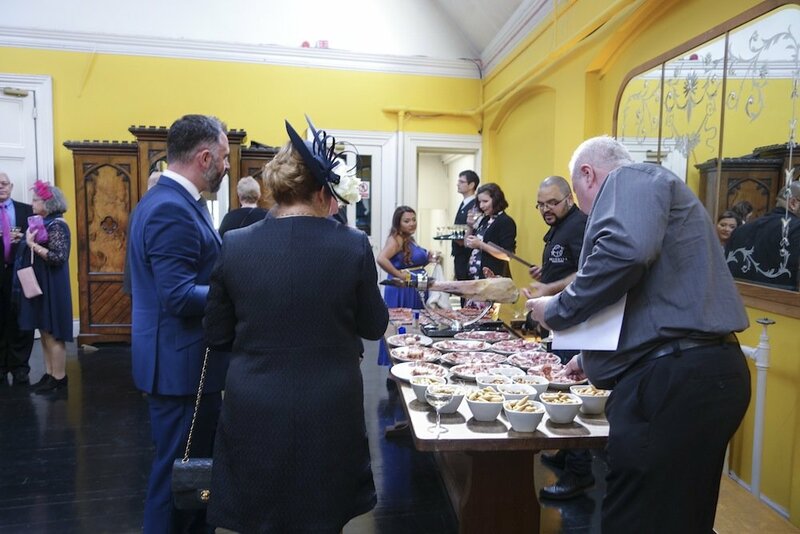 Guests arrive from church for drinks reception and some nibbles. Staff to help ham carver if needed and make sure the food table is tidy. Guests to go into the main room and have dinner. Staff to replenish glasses and clear tables where required. Salt&Pepper staff to pack everything down and move into the yellow room for collection on Monday. 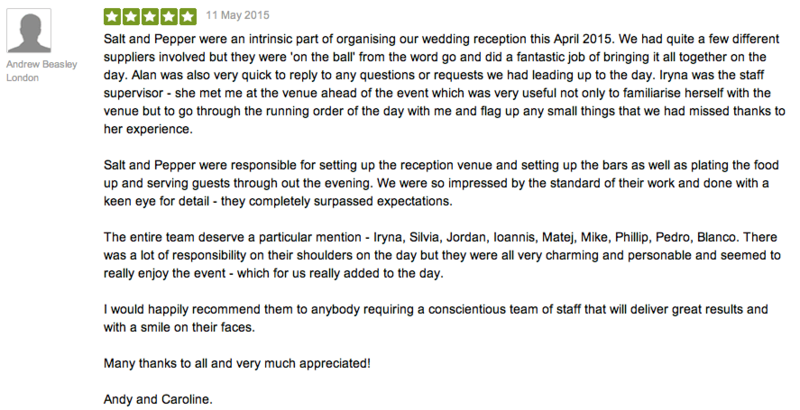 To read reviews about other weddings we supplied our supervisors, waiting staff and bartenders for, visit Salt&Pepper FreeIndex profile.